Many years ago, when I first heard somebody reveal those secrets to life, I believed them, immediately. Why? Because they matched my value system — how I’ve tried to live. I remember those three things, whenever I can, and offer them to others. Regarding the other two parts — showing up and telling the truth — I’ve had no trouble remembering those. I’m really good at showing up. For example, I’ve shown up here, every day this year, with a post. No problem. Sometimes, maybe I show up at places when I really don’t have to. For example, maybe I should take a day off from work (or from other obligations), more often than I do. 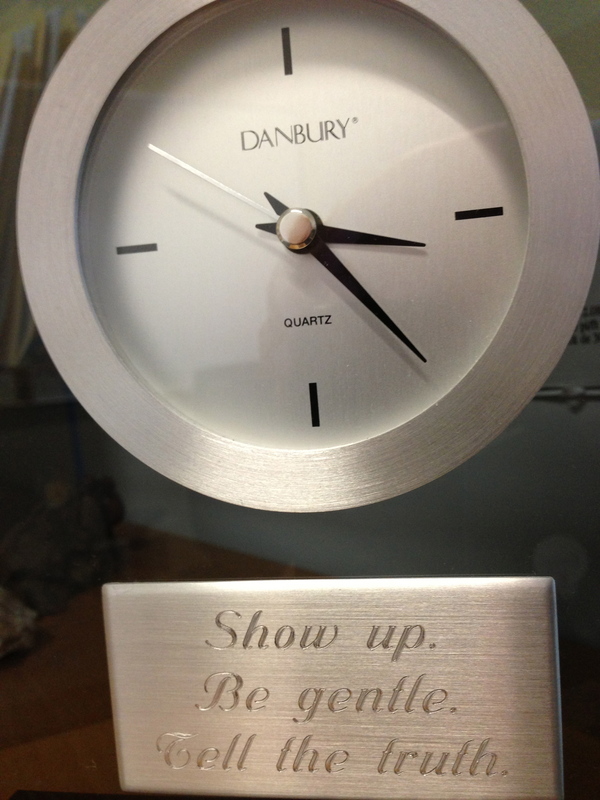 I would like to be more gentle with myself, regarding the showing up — to remind myself that I have choices. Regarding Part 3 of The Secret to Life, I can also be a little … what’s a good word? — extreme. That’s because Telling the Truth is very important to me. My parents were very honest. My parents let me know how much they valued honesty. And if I were going to change anything in my life — ANYTHING! — I would change that encounter, with that lie. And it helped to realize that (and to write, now, too). I still value honesty, sometimes to the extreme. What is my definition of Extreme Honesty? Answer: When you tell the truth, even when it is not to your benefit. Getting into a car accident, where you and the other driver conclude all the fault is his, realizing soon after that you are somewhat at fault and calling the other driver to confess. Being involved in a law suit, finding a document that might hurt your case, and confessing about its existence (even though you could easily ignore it). Extreme Honesty doesn’t always come easy, I must confess. Sometimes, it involves many hours of soul-searching, including the wish to Not Tell. Today, I want to be honest about something that I discovered yesterday, on the internet. This year, I’ve been more open and up front about my experience with illness and hospitals, especially when growing up. Some of that honesty has involved bragging. I am the longest surviving person in the world with a pacemaker!! Ta-da!! Wow, I’ve got everybody beat! I recieved my first pacemaker at 21months old in June 1962. ( first infant) Next year I will have been pacer-powered for 50 years.I ran on nuclear energy for 30yrs and was one of the 1st 15 people to get an american made nuclear pacer. I was born with a total heart-block with 2 holes in my heart. One closed after the pacer was installed and I had open-heart surgery to repair the second when I was in my 30’s.I now run on a state of the art defibulator and all 4 chambers of my heart now function for the first time.Lets hear it for great technology & fantastic Doctors!! When I found that, I immediately sent it to my cardiologist. I knew I would blog about it today. Maybe this is resistance — to giving up what I’ve “owned” for many years — but that story does seem, in some ways, incredible to me. An enormous pacemaker (much larger than mine, probably, because that was over a year before my first one) given to an infant? I didn’t think they were doing that. However, it’s possible. It’s definitely possible. And I know this: When I tell the stories of my childhood experiences with pacemakers, they can seem unbelievable. And here’s something else that matters a great deal, to me: To be believed. One thing I’ve learned, Ann, is never to doubt you. That, in ways, means more to me than any record. So, how do I want to end this post, today? I think I showed up, was gentle, and told the truth. Here’s one thing that feels left undone, though. 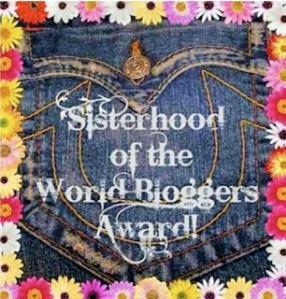 Yesterday, Shaun of prayingforoneday gave me the Sisterhood of the World Blogger Award. While I have mixed feelings about awards at WordPress, I accepted that award, with honest gratitude, where it was given (in the comments of my About page). I KNOW I deserve THAT award. Many thanks to Shaun, to Rocky Hutchinson, to the longest surviving person in the world with a cardiac pacemaker (wherever that person is**), to people doing their best with honesty (and other endeavors), and to you, especially, for visiting today. ** See more about this, here. Thank you for this very kind comment. It means a lot to me. The title says so much. A great teaching and mantra to live by. Thanks, Ann. You are most welcome, Eric. Thank you for visiting and commenting. Thank you, Mark, so much. Just stumbled upon your post. Was wondering who the longest living person in the world was living with a pacemaker. I received my first pacemaker when I was five years old – 1961. I have had my pacemaker for 52 years! I would love to connect with you if possible. I knew there was someone out there who could share their experience. Teresa, you very well may be the one. Congratulations! And I am so glad you found this blog. I write about experiences we probably have in common, a fair amount. (Although other people seem to relate to these experiences, too, which I always find so interesting.) I am glad we’ve connected here, already.